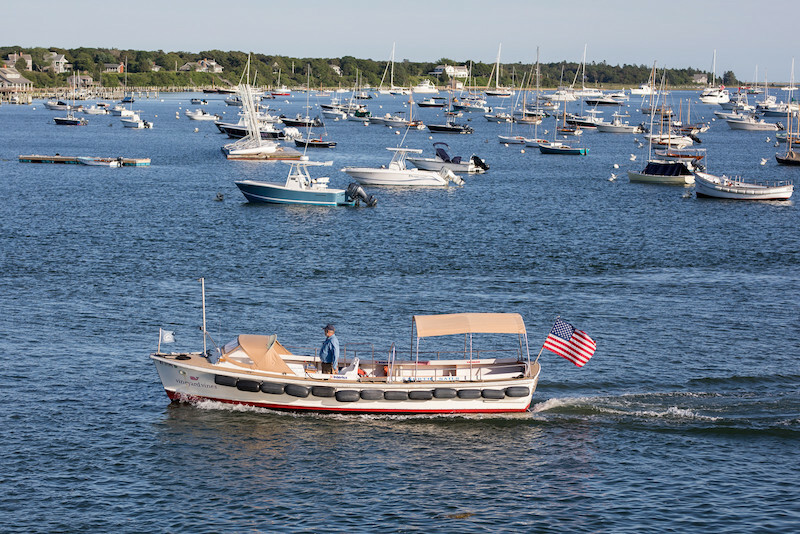 With Fourth of July around the corner, Edgartown harbor is already busy. Edgartown is gearing up for Fourth of July festivities with extended bar hours and parade plans in place. Parade organizer Joseph E. Sollitto Jr. appeared before selectmen Monday to formally invite them to judge the float contest at the town parade. Little will change this year, Mr. Sollitto said. Assistant to selectmen Kristy Rose is leading the organization, he said, while he and town clerk Wanda Williams, also a longtime parade organizer, are following along. One new element will be the addition of people running for office — selectmen have approved the inclusion of candidates for Mr. Sollitto’s position as Dukes County superior court clerk. Mr. Sollitto is not running for re-election this year, though he said he will continue to organize the parade. Candidates are not allowed to pass out fliers. And anyone who hands out candy is asked to do so “respectfully and carefully,” Mr. Sollitto said. The parade will start promptly at 5 p.m., Mr. Sollitto said, following the tradition of longtime parade organizer Fred B. (Ted) Morgan Jr.
“As it always has,” selectman Art Smadbeck responded. Participants should arrive by 4 p.m. at the latest and ideally between 2:30 and 4 p.m., Mr. Sollitto said. Those with convertibles to carry selectmen and veterans are asked to arrive by 3:30 so they can be at the front of the line. “Another year,” selectman Michael Donaroma said. “It goes by so fast,” Mr. Sollitto said. In other business police chief Bruce McNamee said the police department does not object to extended bar hours on the Fourth of July. Last call will be extended to 1 a.m. with closing at 2 a.m.
Chief McNamee and selectmen briefly discussed a proposed change to the wording of the police contract. The existing collective bargaining agreements states that employees should complete 75 mandatory hours of physical training in a 12-month period, and if they do they get $800. Four officers participated in the program, the chief said, and previous police chief David Rossi and representatives from police unions said it was their understanding the requirement was meant to be voluntary. Mr. Smadbeck and Mr. Donaroma, who both attended bargaining sessions, said they also thought the requirement was meant to be voluntary. Discussion was postponed so police and selectmen could explore the matter with new town administrator James Hagerty. The board also agreed to further discuss concerns about traffic and bicycles on Upper Main street. Resident Sara Piazza sent selectmen a letter outlining concerns about the area. “It’s a very tough spot,” Mr. Smadbeck said. At the end of the meeting dredge committee assistant Juliet Mulinare updated selectmen about whether Tisbury could hire Edgartown’s dredge for urgently needed dredging at Lake Tashmoo. The dredge is stored at the town barn. A crane would need to be used to get the dredge from the barn to Tashmoo.